What did India mean to a true nationalist? Is there a god? How did the British see the world and India's role in it? What did India mean to a British Officer? A story that searches for man's ultimate question. A gripping 45 minute one-man-show that revolves around the thoughts of one of India's greatest patriots - Bhagat Singh. Based on Bhagat Singh's famous essay which he wrote before he was hanged, the play is a conversation between Bhagat Singh and his British guard. The guard wonders why a man who is about to die, doesn't believe in God. And tries to convince him that belief could make his last few days easier. In a seemingly light manner, the audience gets an idea of pre-independence India, what it means to a man who is willing to give his life for his country and what it means to the ruling class. The conversation though light and frothy, addresses a serious subject with sensitivity. Thought provoking and ending with an engaging surprise the play has universal appeal. 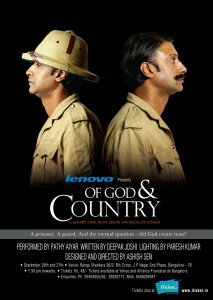 Written by established Bangalore-based writer and creative director of Ogilvy & Mather, Deepak Joshi, and Designed and Directed by Cambridge Graduate and well-known theatre actor/director Ashish Sen, the play is performed by Pathy Aiyar, who has more than 20 years of theatre and 30 plays under his belt.